In this video Dr. Sinatra talks about high LDL cholesterol, how statin works, and Coenzyme Q10 (CoQ10) benefits. The following Cholesterol FAQ (Frequently Asked Question) is seen in Joy Bauer’s book: Food Cures. I did everything right—I saw a nutritionist, I started exercising, and stopped smoking—but my LDL cholesterol is still high. My doctor put me on a statin medication. Is there anything I should do differently with my diet? First, keep following all of your doctor’s advice. If your cholesterol returns to normal levels, don’t stop—the change means the program is working, and it’s a lifestyle change not a temporary one-time fix. Statins are valuable medications, but they are just one tool for keeping cholesterol under control. The nutrition and lifestyle changes in this chapter can help turn your risk factors around, which will mean better health in the long run. However, some people have a genetic predisposition to make cholesterol and may still require medications in addition to lifestyle changes. Finally, many health experts (including me) recommend that their clients who take one of the cholesterol-lowering statin medications also take a supplement called Coenzyme Q10. Coenzyme Q10 is an antioxidant necessary for energy production in cells. Without CoQ10, cells can’t function properly. Our bodies usually make sufficient CoQ10 to keep us healthy. Statins work by inhibiting the mechanism that allows the liver to make cholesterol, but they also slow the body’s production of CoQ10, leading to deficiency. To counteract these effects, I recommend taking 100 milligrams of CoQ10 once a day in a soft gel formulation. Although most people can take CoQ10 safely and without side effects. 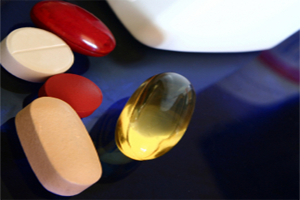 It is always a good idea to talk with your doctor before taking any supplement.